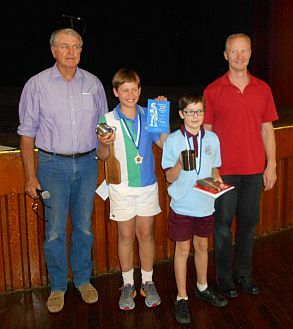 Sponsored by Corfield and Fitzmaurice, Janine Haig, Jennifer Bell, Gary Fogarty, Winton Shire Council and the Winton Outback Festival, the 22nd annual awards were co-ordinated this year by Julie Dorries and a team of willing workers. Conducted by the WBTA - Winton Business and Tourism Association Inc. Catering was by the local ICPA Branch and the venue was the Winton Shire hall. The hall was packed with excited parents, relatives, supporters and of course the children who had come from Winton State School, St Patrick's Winton, Hughenden State School, Longreach School of Distance Education, Longreach State School, Our Ladies School Longreach and St Francis Hughenden.Many thanks to all who travelled. Group Performance, Prep to Year 2.